This guide provides basic feature information, basic safety information, a site map and videos of the features. The purpose is to increase knowledge and help people make better decisions. This guide is always incomplete and not all dangers are listed. 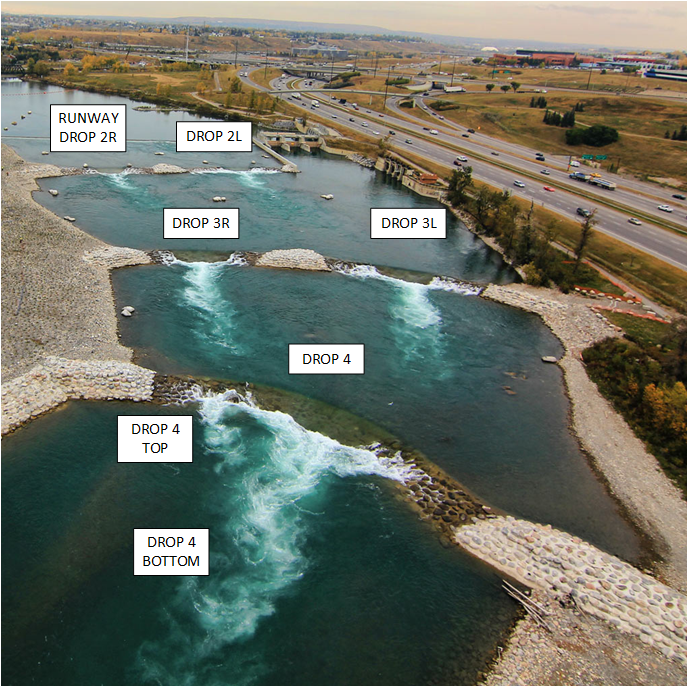 The Bow river constantly changes so always assess the river and take proper precautions before getting in the water. Reading this will not keep you safe Let us know if you have new information or improved information. You can reach the Alberta RSA Board at info@AlbertaRiverSurfing.com. Make sure you are properly trained and equipped. You are entirely responsible for your own safety and the risks you take. The Harvie Passage was not designed with the intended use of river surfing and was not designed to have good waves. There are no good surf waves at the Harvie Passage. There are some features that can be used by surfers and it is good paddle practice. There are some sections that are very dangerous. Use at your own risk. The high water / north channel has needlessly terrible feature design that wastes the drop and width of every feature and is high risk. The low water / south channel is excellent and provides a great introduction to rivers and river recreation. The Alberta RSA is working on a project to build world class, safe and adjustable waves at 10th Street Bridge. You can find out more about the project at AlbertaRiverSurfing.com/surfyyc. The Harvie Passage consists of two channels. The High Water / North Channel is very dangerous and is on the left side of the image below. The Low Water / South Channel has risks but requires less experience and is on the right side of the image below. Features are named is by the first person to stand up surf it on a surf board without a paddle. These areas of the high water / north channel are always dangerous because you can be swept over the shallow large boulders on the side of the drops. The areas marked are not exact and can dramatically change over time and with flows and the danger areas can become much larger. Assess the river before getting in the water. Stay in the middle of the drops if coming from upstream or exit the river and walk around. Other dangers exist. When in the water above the drops it is impossible to see the drops. You need to know your position before getting in the water. View of drop 4 from upstream on an island. Half of drop 4 is very dangerous due to shallow water and large boulders. When in the water upstream, each of the drops is completely hidden. Some key safety measures but other measures can be taken and these do not guarantee safety. Be aware of you position in the river. You cannot see the drops and the dangerous boulders on the side when on your board. Some of the dangers but other dangers exist. The sides of the every drop are very dangerous because there is shallow water flowing over large boulders. Drops 3L and 3R are very dangerous because missing the paddle out can easily drag you over the rocks beside Drop 4. Some features can be retentive and recirculate surfers. Features change over time and with flows. A feature could be safe under certain conditions but become hazardous as conditions change. Good waves were not part of the Harvie Passage design but there are a few features in the high water / north channel that can be used by a surfer. The high water / north channel has needlessly terrible feature design that wastes the drop and width on every feature and is high risk. This feature is very flat and has been ridden using very high volume boards at flows about 135 cms. At 105 cms the wave could not be caught on surfboard lying down. Entry can be from the sides or dropping in from above. Runway on July 7, 2018. David Manning Riding Runway on a SUP on July 6, 2018. This feature came in a higher water levels. The level is not confirmed but it was above 140cms. The feature can only be accessed by dropping in from above when on a surfboard. Feature is narrow, steep, bumpy and flushes on surfers right. Neil Egsgard on Drop 4 Top on May 18, 2017. This feature seems to be in at all water levels. At 105 cms, the feature can be caught from the side. The feature is bumpy and rapidly changes. Neil Egsgard on Drop 4 Bottom on July 7, 2018. There are no surfable features in the Low Water / South Channel. The Low Water / South Channel can provide an excellent introduction to rivers, flow patterns and safe river usage. Additional videos of each feature in the High Water / North Channel. Additional videos of features in the Low Water / South Channel. 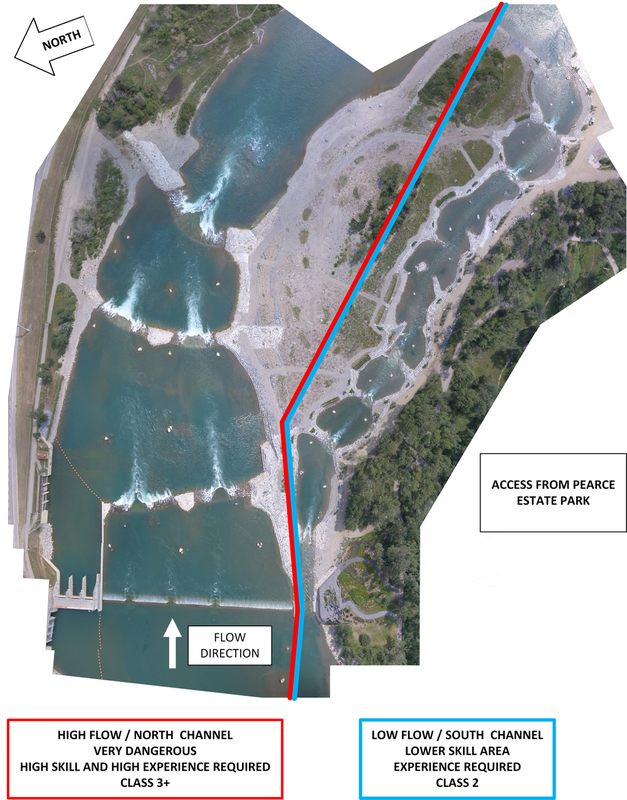 The total flow at the Harvie Passage is measured by combining two gauges: Bow River at Calgary and Elbow River below Glenmore Dam. You can find the flows at Rivers.Alberta.ca. The flow at Harvie Passage splits into the Lower Water / South Channel and the High Water / North Channel. Most of the water goes through the High Water / North Channel. Access is through Pearce Estates on the east end of Inglewood. There are no changing facilities. There are washrooms that are sometimes open in the park. There are no washrooms at the river. You park at Pearce Estate Park.